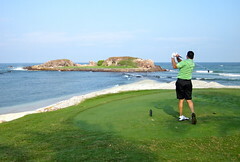 The sport of golf is connected to many injuries due to the repetitive stress placed on your body. The stress can not only occur during a golf swing, but also with walking, standing, twisting, turning and squatting associated with the game. .
Intermetatarsal Neuroma: This condition also known as Morton’s neuroma most commonly occurs in your non-dominant foot because of the repetitive trauma caused by swinging a golf club. The nerves between the metatarsals are irritated when your forefoot is twisted inward during the ending movement of your swing. This condition can cause severe inflammation of the nerve resulting in pain, electrical sensations and even instances of numbness. Hallux Subungual Hematoma: This condition pertains to your big toe nail. During the follow through of your golf swing, your dominant foot will swing into a stance that rests on your big toe. This can cause an overload of pressure that pushes the big toe into the front of your shoe. Eventually it can lead to serious pain from bleeding under the nail giving it a bruised like discoloration of your toenail. If your big toe is jammed into the side of the shoe, it can lead to a painful ingrown nail and infection. Plantar Fasciitis: This condition is from overstraining your plantar fascia, which is the strand of tissue that stretches from your heel to the arch of your foot and all the way up to your toes. Your golf swing can over stretch or strain the plantar fascia. This can lead to micro tears and inflammation and thus pain. Achilles Tendonitis: This condition can erupt when the Achilles tendon, the band of tissue that connects the heel of your foot to your calf muscles, is subjected to repetitive stress and strain. This tendon can also rub on the back of your heel bone. The stress and pressure can result in severe inflammation, swelling and stiffness. You can avoid these conditions by obtaining quality golfshoes that provide not only optimal function but also are ideally fit. Ideal fit requires a professional fitter not only to size you, but most importantly, to match the shape of the shoe with your feet and match the ball of your feet with the bend of the shoe. As it is rare for your feet to be identically symmetrical like the premade golf shoe, for the most serious golfer who wants to improve their game, a custom-made golf shoe would be your best option.The custom molded golf shoe will exactly match the shape of your feet thus minimizing any loss of energy transfer in your swing from your feet deforming to a premade shoe. These will inspire your game and help prevent injury. Golfers can also look into golf specific orthotics for even greater cushioning and support. Custom golf orthotics will allow the feet to maximally perform for your greatest physical ability. Not to mention, avoiding undue stress, strain and pressure which can lead to injury. Both golf specific shoes and orthotics are intended to keep your feet healthy throughout all of the motions in the game. Shoes specific to your sport are all about allowing you the best function while keeping your feet feeling good and your game looking good. If you are a serious golfer, stop by our store, ArchMasters-Orthotics,Shoes & Footcare, llc., where our trained staff will be happy to find the ideal shoes andor orthotics for your personal needs. If you have any questions or concerns, call our store at (615) 370-3000 and ask to speak with trained Podiatrist/Pedorthist, Dr. David Sables or Licensed Certified Pedorthist, Linda Sables.